Discussion in 'Bible Prophecy' started by Joshuastone7, Feb 4, 2018. So, I've kept an ongoing study in scripture, in which while studying other material I keep an eye out for the "how" the Watchtower profanes Gods name. We have pretty clear evidence why the WT falls, and why Jehovah sends the Northener to bring down his house in general, but the question is, what are the words the little horn speaks, what is the denunciations hurled and the action by the WT that profanes Gods name in the world? As I mentioned before, we have the reason Jehovah brings down his own house in just about every prophetic book in scripture; But the specific error by Gods people in the eyes of the nations? Certainly it's not enough for the nations to bring down Gods people because they send his sheep out without a shepherd, or practice spiritual fornication. There must be something the nations find illegal that facilitates them to come against Gods house, but does scripture tell us what that is?
. For his princes are in Zoʹan, And his envoys have reached Haʹnes. So if Zoan (Wikipedia) is where Moses performed the miracles before Pharaoh, then this moment spoken of in Isa 30 is prophetic of the period just before the plagues of Revelation. Pharaoh's princes will be at their locations in order to witness those coming plagues prophetic in the time of the end, and performed by the two witnesses of which Moses was a first type. "Pressure mounts on President Donald Trump to take action against Russia over a ban placed on the religious organization (Jehovah's Witnesses) by the country’s Supreme Court. There were earlier reports that Trump has warned the Russian government to reverse its decision as he ‘would use the country’s own constitution against them”. Jared Kushner, who doubles as Trump’s in-law and Senior Advisor to the President is known to be a very good business associate of the Jehovah’s Witnesses. Steven Scott, a political analyst said the Jehovah’s Witnesses “have a friend with the president’s ear” and as such, Jared Kushner would persuade the presidency to act on Russia’s decision. A source close to the White House has hinted that Kushner is mounting pressure on his in-law [Donald Trump] as he [Kushner] would be chairing a committee to “pressure and take action against Russia” until it lifts the ban on Jehovah’s Witnesses. “Probably Jehovah’s Witnesses in Russia could seek asylum in the United States if it doesn’t work out” – the source said." If these matters are fact, then I could see a direct fulfillment of Gods word in Isa 30 when it says "They go down to Egypt without consulting me, To take shelter under Pharʹaoh’s protection, And to take refuge in the shadow of Egypt! But the protection of Pharʹaoh will become for you a reason for shame, And refuge in Egypt’s shadow a cause for humiliation." As well, if Kushner lobbied Russian officials and investors to invest in his purchase of the buildings in Dumbo, and that information comes out in the Mueller probe, what would that do to the image of JW's? No doubt in those thousands of emails Mueller now has is emails between him and ranking members of the Jehovah's Witnesses. ExLuther and Baruq like this. I've come across something interesting I wanted to share. Kenneth Copeland says, "2018 will be a year of the Holy Ghost and fire!" What does he mean by this"? There was a meeting of world religious leaders in Oct 2017 known as "Kairos 2017", with the agenda of these leaders being to bring about unity of all Christian denominations, bringing all Christendom under the head of the Catholic church. That year was the 500th year since the separation of the Protestant faith, since Martin Luther had nailed his thesis to the door of the Catholic church. These ones who head this revival such as Kenneth Copeland (who was the main speaker at this event), now describes the Protestant reformation as a product of Satan, as a product of division driven by Satanic influence. With no regard for the thousands who died bringing the Bible to all of us, to bring faith and hope to all of us, to put an end to the tyranny of Roman Catholicism, and so on, they announce Martin Luthers "protest" as the great sin devised by Satan himself. Kenneth Copeland said "The protest of Luther is over", and now that he supports the "joint declaration on the doctrine of justification" that was signed in 1999, that brings about an almost complete one world religion, uniting Catholics, Lutherans, Methodist, Evangelical and Protestant alike. Another spokesman for this gathering together with the Catholic church is Bishop Tony Palmer, who also says "The protest of Luther is over. ", and that "It was the division that was diabolic." Both he and Copeland explain that "true racism" in the world is the separation of faiths, and that the laws keeping separation in place is "the real sin" that caused division, and this includes the law of separation between church and state. Even the Pope says in one of his comments, "It was sin that separated us." According to these men "This law must be abolished that empowers separation", that law of the separation of church and state. These three talk about their mission being in the "spirit of Elijah". Why do they say this? Elijah is the one that caused fire to come down before men to burn up the worshipers of Baal, to bring about the regathering of the people, and they believe they will be fulfilling that prophecy of the Elijah to come this year, and that this gathering together represents it's fulfillment, once the cleansing by fire takes place. I quote Mr Copeland on what he, the Pope and this Mr Palmer apparently have spoken together with, that will be fulfilled this 2018, "But we're going to have spiritual explosions going on throughout 2018 in the areas, particularly in the areas of holiness and cleansing." Now we know that the fires refine Gods people, and the judgement begins with the house of God. (1Pt 4:17) So if they need to "get rid of all forces standing in the way of unity" (as Mr Palmer said) then the Jehovah's Witnesses have to go. If it's a time for "cleansing in 2018" as Mr Copeland has said, then this could be the time, this could be the year the fire comes down from heaven to refine Gods people, as gold is refined, (Zech 13:9) and the judgement to begin with the house of God! "Kairos" means an appointed time, and it was the Jewish feasts that were set up in their appointed times and seasons to be fulfilled in their own times. Mr Copeland's Oct 2017 speech is available online, as are many other resources and commentaries on his and these others comments, so feel free to look into this matter further, but these men seem to be unwittingly fulfilling prophecy that will end in a manner they do not expect. For God will use them to come against his house for their errors, yes, but he will demand the blood of all mankind back from THEM there after! Have the Jesuits penetrated the Watchtower? "A fifth column is any group of people who undermine a larger group from within, usually in favor of an enemy group or nation. The activities of a fifth column can be overt or clandestine. Forces gathered in secret can mobilize openly to assist an external attack. This term is also extended to organized actions by military personnel. Clandestine fifth column activities can involve acts of sabotage, disinformation, or espionage executed within defense lines by secret sympathizers with an external force." "My son, heretofore you have been taught to act the dissembler: among Roman Catholics to be a Roman Catholic, and to be a spy even among your own brethren; to believe no man, to trust no man. Among the Reformers, to be a reformer; among the Huguenots, to be a Huguenot; among the Calvinists, to be a Calvinist; among other Protestants, generally to be a Protestant, and obtaining their confidence, to seek even to preach from their pulpits, and to denounce with all the vehemence in your nature our Holy Religion and the Pope; and even to descend so low as to become a Jew among Jews, that you might be enabled to gather together all information for the benefit of your Order as a faithful soldier of the Pope. (He receives the wafer from the Superior and writes his name with the point of his dagger dipped in his own blood taken from over his heart.)" So similar arguments for unity as at Jehovah's witnesses. That unity is more important than doctrine. That you should not try to correct false doctrines in order to preserve unity. But Jesus said the truth will set you free. And Jesus set the example. He did not come to unite the Pharisees and Sadducees or other factions. He came instead to bring in the truth and expose the falsehood and hypocrisy. 2018 I expect will bring great changes. September 23 2017 has passed, and to my understanding soon after this date Revelation 12 and 13 should start to fulfill. I am expecting the North Korea crisis to lead soon to the death stroke of one of the heads of the beast. And shortly its revival with a NWO and defiling of the holy place with the disgusting thing. I have waited my entire life to see the Fulfillment of just one of the prophecies that they keep telling me it's supposed to happen I hope just for once it actually happens it would be a welcome change! I have been doing some thinking these last few days about this subject, and I wanted to share some insight. The image of the wild beast in Rev 13 could very well be the "Joint Declaration on the Doctrine of Justification (JDDJ)". An agreement between many differing religions to come together into one understanding, not unlike the EU or UN charters. The Holy See will do everything it can to get rid of the Reformation, and it's war is against Protestantism. If the Holy See is plotting against JW.org, for not excepting their "JDDJ" then they will cast blasphemies against the Watchtower into all the world news. 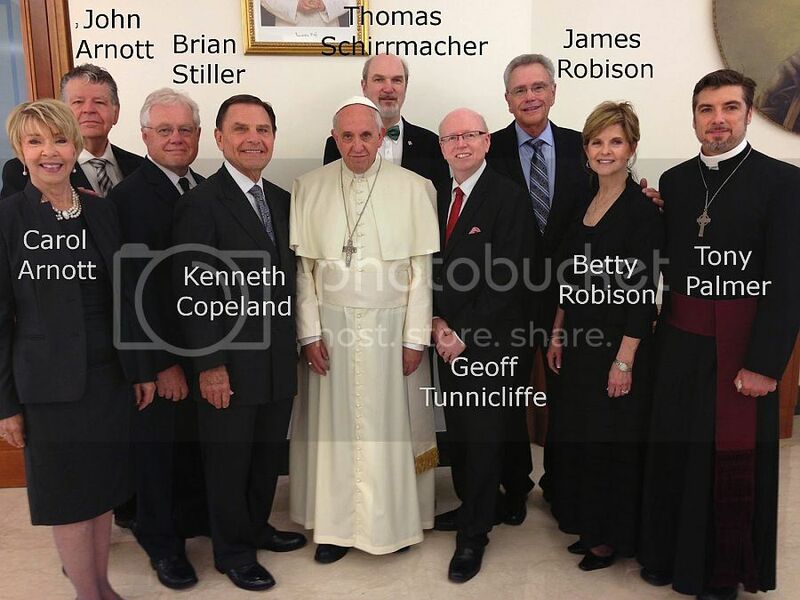 Are their some of the Governing Body who already have ties with the Holy See? Have the Jesuits penetrated JW.org?